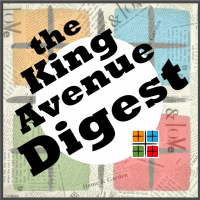 Check out the featured announcements on the King Avenue Digest, then click on the links to read more. The rest of the Digest has more comprehensive happenings organized by ministry/category announcements that pertain to you. You can also download the Carillon to get the full picture! Click HERE to download this month's Carillon Newsletter. Click HERE to download this month's calendar highlights. Performances Thursday, March 8 at 7:30pm; Friday, March 9 at 7:30pm; Saturday, March 10 at 7:30pm; and Sunday, March 11 at 3:00pm. UMCOR Sunday, March 11, allows The United Methodist Church to respond when disaster strikes. Think of UMCOR as our “Go Team” who can be present when help is needed. Unlike other benevolent causes, UMCOR receives no funds from the regular United Methodist Church budget. 100 percent of all other donations go toward specific relief projects. Do You Feel Called to a Service of Prayer? There are two ways that you can serve in a ministry of prayer at King Avenue: become part of the Prayer Team or serve as a Prayer Partner. You can learn about both of these ministries in one of two sessions led by Trecia Holdren, leader of the Prayer Partners, and Rev. Colleen Ogle, leader of the prayer team, on March 11. If you are interested, please attend. King Avenue Chancel Choir and Orchestra present Requiem by Gabriel Faure on Sunday, March 18 during the 11am Service. This is a good opportunity to invite family and friends to church - enjoy some wonderful music, worship, and fellowship. Family, a collaborative art exhibition by King Avenue Children Youth and Families – It's our time to let our creativity shine! King Avenue Children and Youth will be featured in the King Avenue UMC Gallery from March 18 through April 22. Some people have expressed an interest to set aside a time of corporate fasting. It is a time when we combine our thoughts and voices to pray for our nation, our state and city our leaders, our church and ourselves to seek God's Voice to lead us to a deeper understanding of Himself and how to minister to each other, both inside and outside the walls of our church. Due to medical conditions, etc., everyone can decide if they wish to fast for one meal or the entire day, that is your personal choice. Please, speak with your doctor or other professional if you have conditions that may prevent fasting from food to ensure you get medical approval. You may also participate with another type of fast, for example, by spending an hour or more without using electronics or social media and instead focus yourself in prayer on God. Volunteers Needed - March 25 - Join your King Avenue Family following the 11 a.m. Service on Sunday March 25 for lunch and fellowship. Please email Steve at expect.sh@gmail.com to volunteer for the following times: 8-10 prep & cook, 10 - 12 cook & serve, 12-1:30ish serve, cleanup and room reset. Mark your calendars, and get your promposals ready! Saturday, May 12 is the Prom for ALL!